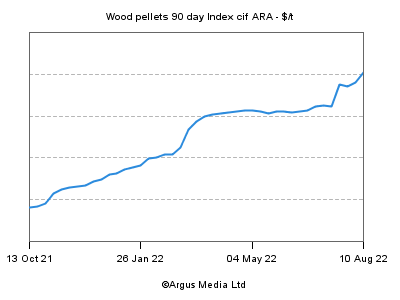 With the wood pellet industry hurting from low fuel prices, warm winters, and unhelpful government policies in many countries, is there a light in the gloom? The potential of global markets was the topic de jour during the annual Wood Pellet Association of Canada conference, which took place in Harrison Hot Springs, B.C., Sept. 20-22. The short answer, according to William Strauss from FutureMetrics, is Japan. Strauss stressed that the Japanese market has potential to boost growth for Canadian pellet producers, specifically in Western Canada, but also those in Central and Eastern Canada. "We all know that we are in a plateau right now in terms of production," Strauss said. According to his estimates, there is currently 2.5 million tonnes of over capacity, however, with new projects and policies, that overage will be soaked up by 2018, and demand will overtake supply by 2020. John Bingham from Hawkins Wright has similar numbers; he estimates that global demand for pellets will increase to 27 million tonnes by 2020 based on new projects in the pipelines in the United States, Japan, United Kingdom and other European countries. Japan, specifically, Strauss said, with its carbon reduction mandate, is an emerging market that could change the game. "We think there is a high likelihood of significant demand over the next decade," Strauss said, estimating that by 2020 there could be demand in excess of 15 million tonnes. That demand would be best met by producers in Western Canada due to proximity. If pellet producers in Western Canada were kept busy with the Japanese market, those in Eastern Canada would increasingly send their supply to Europe. The United States as a market is a wild card for pellet producers, with the implementation of the U.S. Clean Energy Plan tied to the election this fall. Speaking as part of a panel discussion of producers, Vaughan Bassett from Pinnacle Renewable Energy said the pellet industry as a whole needs to push to produce biomass without subsidies. He agreed with Strauss that Asia is a target market, and an opportunity for Canadian pellet producers to, "demonstrate that they are strong suppliers to the market." Other discussion on the panel was sparked by a query from moderator Arnold Dale, vice president of Bioenergy Ekman & Co, who asked: is it the role of pellet producers to promote end-user products? "I always feel that a local market is the best market," Dale said. Getting local companies or government office and schools to convert to wood pellets creates small but sustainable demand, he argued. Panellists seemed to agree with Dale, while noting that that strategy makes the most sense for small producers in heating markets, less so for large-scale industrial producers. Day 2 of the conference continued discussions about potential growth in current and new markets. Rachael Levinson with Argus Media gave a global overview of biomass power projects coming online, and their expected demands. The United Kingdom is still the largest consumer of pellets, she said, which is not likely to change in the near future. Brexit is on everyone's mind, but it will be two years before it has any substantial effect. Speaking to biomass' future in the Netherlands, Henry Pease with RWE Supply & Trading said there is an expectation that government investments made between 2013 and 2020 will increase demand to 3.5 million tonnes. Pease stressed that attaining certifications, including the Sustainable Biomass Partnership (SBP) certification, is becoming increasingly important for pellet producers. FPInnovation's Charles Friesen updated conference goers on the current state of Canadian fibre supply. Canada is a world leader in large-scale production of forest biomass, but transportation costs mean that much of that biomass is left in the forest. "There is lots of material if you are willing to pay," Friesen said. He also noted that proactive measures to eliminate the mountain pine beetle will eventually dry up the ready supply of beetle-affected wood. Discussions then turned to Alberta and its Climate Leadership Plan. FutureMetrics' William Strauss opened the talk by providing evidence that Alberta does indeed have potential for full-conversion of certain power projects, but education is key. Utilities and policy makers, he said, need to know about the benefits of using wood pellets. Jamie Stephen, founder of Torchlight BioResources, made a strong point about how low natural gas prices have created a unique power generation station in Alberta. Wind and solar, he said, are not the competitors to wood pellets in the province – the competition is gas. According to Stephen's models, using purely wood pellets for large-scale power generation will be a hard sell to utilities when the operating cost of gas is so low, even after factoring in Alberta's carbon levy. An alternative, Stephen said, would be to supplement pellets with low-cost feed stock. If attendees had just one takeaway from Day 2 of the conference, the WPAC's Safety Committee would like it to be about process safety management. "Process safety management" was the buzzword of the safety discussion at the conference, which kicked off with WPAC Safety Committee chair Scott Bax. "Safety is all about your people," Bax said, who is the senior vice president of operations for Pinnacle Renewable Energy Inc. "We know the return to business from an engaged, active safety culture is incredible." Process safety management, Bax said, has been embraced by WPAC as a method to help companies create that safety culture. Ellis Whalen with ABCS Safety Training explained process safety management as a blending of engineering and management skills to design and maintain safe processes. "It is your responsibility to make sure your employees are competent and trained to perform their tasks," Whalen said. Implementing process safety management involves hazard assessments, the development of operating procedures, training, and auditing. Cherie Whelan, the new director of Safe Companies for the BC Forest Safety Council, told conference goers to expect a flood of near-miss reports from the council, which she said can help other companies learn to implement safer processes. "Start sharing [near miss incidents] within your own organization, your industry, and then with the BC Forest Safety Council," she said. WPAC Safety Committee is planning to hold a one-day process safety management training session in the coming months. The conference wrapped with presentations on new technology in the industry from Firefly AB, Player Design Inc., Fike, Dryer One and Smart Heating Technology.